Those of us who have spent the last 20 years looking at E Bay for Eddystone Receivers could not have failed to notice that there is a town in Pennsylvania also called Eddystone. 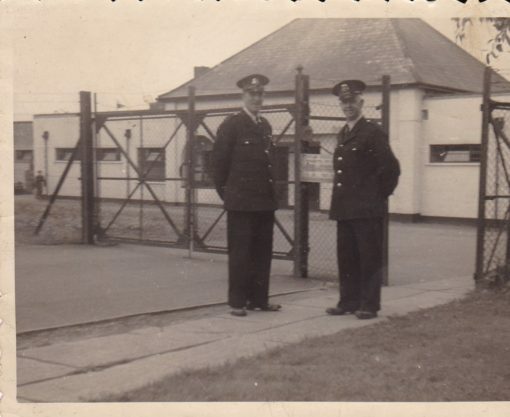 Occasionally you would see adverts for the Eddystone Police shoulder badges and gun-sights and original parts of the Enfield rifle made in the Eddystone Ammunition Works. Well recently I was contacted by Rein De Vlieg from Ursem in The Netherlands. 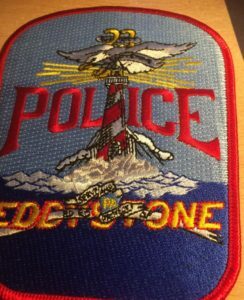 Rein is a collector of Army and Airforce Wireless equipment and he had a Eddystone Police shoulder badge that he wanted to donate to the EUG. 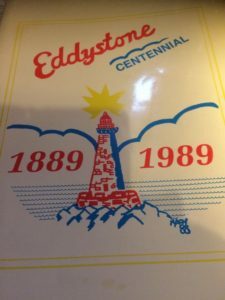 He also had a copy of the Eddystone Town Council Centenary (1889-1989) booklet which gave the history of how the town came to be named after our famous British Lighthouse. A British citizen named William Simpson who was born in Manchester to a family of textile printers, emigrated to America in 1818. He did well and in 1872 he started buying land in what would eventually become the town of Eddystone. He began building a textile factory and at the same time sent his son Thomas Simpson on a two year two of Europe to inspect similar factories. It is said that in 1874, on his way home, Thomas passed the Eddystone Lighthouse and was impressed by its construction. He admired it for its symbolism of strength and on his return to Pennsylvania, persuaded his father that the new factory should be called the Eddystone Print Works. 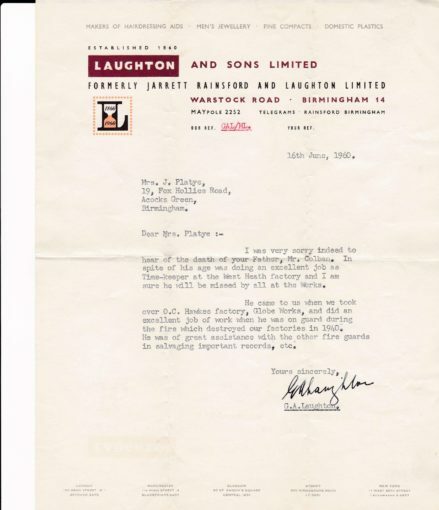 (Strangely enough, this almost mirrors the reason why Stratton Laughton persuaded his father, George Laughton, that the brand name for their wireless components should be “Eddystone”). Back in Eddystone Pennsylvania William Simpson built houses for the workers on the site. This then developed into a small town to which Simpson added a school, a park and a library. By the 1880s, Eddystone was a thriving town of over 450 people and continued to grow and eventually became a borough. In 1890 it formed its own Police department with one policemen and it was 1915 before the police department decided a second one was needed. A Fire Department was formed in 1901. Over the next 100 years, various factories were established including Iron foundries such as the Baldwin Locomotive Works which by 1911 employed 2700 workers. The Remington Arms Plant was built in 1915 on Baldwin Locomotives land to make Enfield rifles for the British Government in W.W.1. By 1917 this had been renamed the Eddystone Rifle Plant. Eddystone is now a town in southern Delaware County on the north bank of the Delaware River with a population of about 2400. Boeing Integrated Defence Systems operate a factory there. Ben G4BXD proprietor of the wonderful Military Wireless Museum in Kidderminster has recently taken ownership of a rare Eddystone S909A receiver. According to the QRG (Quick Reference Guide) to Post War Sets (downloadable from this site) the S909A was a variant of the S909 but with optional external HT/LT source connectors which is probably why it doesn’t have an ON/OFF switch. Some 225 of these were made from 1959-1963. 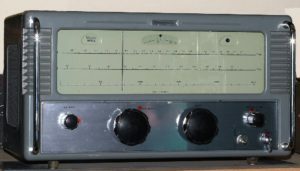 The EDDYSTONE Type S.909, 1958, marine communication receiver, designed for the Swedish Merchant Marine. Two band (1.6-4.7Mc/s) plus fixed switched crystal controlled channel on maritime distress frequency of 2182kc/s. AC/DC 110-250v. AM and MCW only. Single conversion superhet with switchable crystal gate (IF-465kc/s, bandwidth 10kc/s or 5kc/s at 20dB down). 7valves plus metal rectifier. 1 RF; 2 IF. Built-in speaker. Production run of S909 was 100. John Gibson contacted us to say his Eddystone 840C worked nicely as purchased except that the magic eye was ineffective even on strong signals. He said that examination of the DM70 data sheet reveals that for the tube to be operational, its plate voltage needs to be held at about 60 volts, half the high tension level. Any higher and the tube is de-sensitised and barely works. The solution is to wire a 10K 1 W across the existing DM70 plate resistor and another 10K 1 W from the plate to ground (0 V). The plate of the DM70 is now clamped at 60 V, and the magic eye works fine. Can you recognise this component? Ken in New Zealand sent me this picture of an Eddystone part that belonged to his father who also had a much used 680. Ken enquired whether it was part of the 680 or some other set. It looks to me like the shaft insulator brackets that were sold individually as components from the mid 20’s until post war. 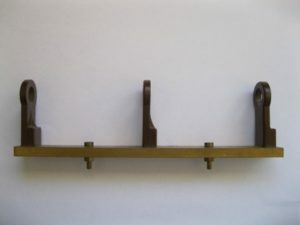 However, none of the component catalogues in the archive show one with three shaft brackets mounted on a brass base plate. So the question is, what set was this used on or was it a long forgotten Eddystone component?. It is about 180mm long and has the name Eddystone stamped on it. If you can identify it let me know and I will pass on the information to Ken. Chris g0eyo@blueyonder.co.uk . I’m sorry to say that I’m not so busy with my Eddystone receivers as before, maybe I’m slowing down because of age? However when I saw the ‘mysterious’ Eddystone part you were interested in, I immediately knew where I could have used such a part – in the ‘Amateur Communication Receiver’ as described in the ‘Eddystone Short Wave Manual No.4’. You must look into the second edition, in the ‘List of Parts’ for this receiver you will find the ‘Condenser Cradle No. 1114’. You will also find it in the ‘Components catalogue’ from 1939″. Bills funeral will be on Monday Dec 5th. 2.30 p.m. at Gwent Crematorium, Croesyceiliog, Cwmbran, NP44 2BZ. Family flowers only, donations in lieu to the R.A.F. Association, c/o Tovey Brothers Undertakers, 9-11, Cardiff Rd., Newport NP20 3EH.